Right click, print, and bring with you for $1 off admission. The two day show will be held at Events at Manchester, Rock Hill, SC. The Biennial Members Quilt Show will include vendors, demonstrations and mini-workshops conducted by guild members, as well as a boutique offering handwork and other items. 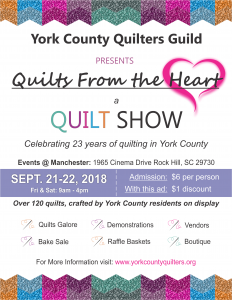 Quilts will be entered and judged in TRADITIONAL, NON-TRADITIONAL and SPECIALITY categories to include Pieced, Applique, Mixed Traditional, Miniature, Art/Innovative, Mixed Media, Pictorial, Modern, Group, First Quilt, and, Wearable and Home Decoration. 1st, 2nd and 3rd Awards will be given out in each category. A Judge’s Award will be given for Best of Show, Best Hand Quilting, Best Machine Quilting, Best Use of Color, Judge’s Choice and Honorable Mention(s) at the discretion of the Judge. Viewer’s Choice will also be awarded. 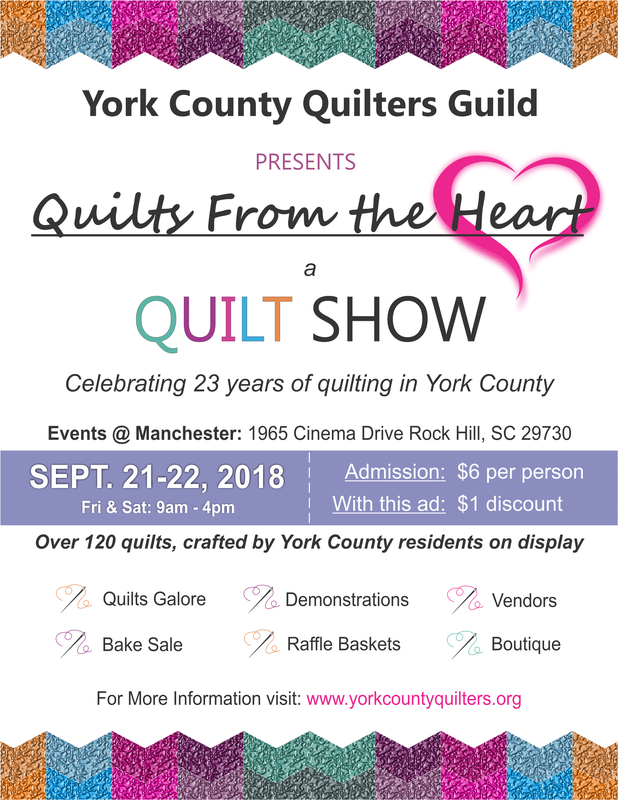 The purpose of the York County Quilters Guild is to stimulate interest in the history of quilts, promote the art of quilt making through programs that demonstrate and teach the art of quilt making, and, provide services to the community through outreach activities. As a policy, if York Technical College is closed due to inclement weather, the guild will also cancel any schedule meeting on those same days. If possible, the membership will be alerted via email and by notification on the webpage when guild meetings have been cancelled. Be aware that when power outages have occurred, it may not be possible to post to the webpage or send an email.